Halloween is still a few months away but if you’re like me then you probably look for just about any excuse you can find to get into the spirit. 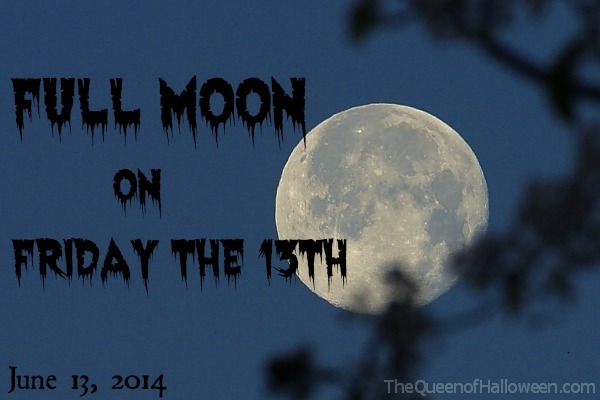 June 13, 2014 provides the perfect way to do that as we’ll be having a full moon on Friday the 13th. Despite the fact that this event is happening smack in the middle of the summer, you can still have fun imagining black cats crossing your path and werewolves howling at the moon to give yourself a spooky feeling. Another special thing about this particular full moon is that it will be lower in the sky, thanks to being so close to the Summer Solstice on June 21. That should give you a spectacular view of the moon, no matter where you are. Looking for ways to celebrate this very special night? You can always invite friends over for an impromptu costume party. Or if you have a large balcony or deck, you can host a viewing party from your home. One thing’s for sure, you might want to keep your celebrations close to home if you’re the superstitious type. Friday the 13th is already considered a very unlucky day by many and adding to that a full moon, which is also known as a night where people can get a little wacky, it’s could end up being a recipe for disaster. So if you’d rather stay home and be safe then maybe you can spend the night planning your next Halloween party or making some fun Halloween crafts. However you decide to enjoy the night, be sure to have fun as we won’t see another full moon on Friday the 13th until August 13, 2049. This article was posted in Halloween Activities and tagged Friday the 13th, Full Moon, Werewolves. Bookmark the permalink. Follow comments with the RSS feed for this post.Post a Comment or leave a trackback: Trackback URL.